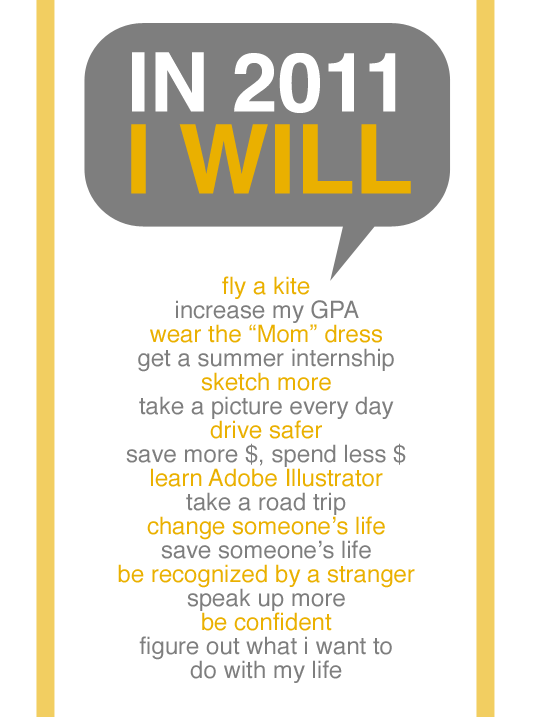 I decided to kick off the new year on my blog by sharing my checklist for 2011. I'm a little reluctant to call them resolutions since some of them are more like goals or things to do. I'll probably think of more as my year progresses but for now I'm satisfied with just these few. half of this list totally applies to me as well! Alright I'll make this easy for you: You can get a summer internship here in California and you will get here by taking a road trip, wearing the "mom" dress, and driving safely. Then once you get here, we will fly a kite, take a picture everyday while you're here, and sketch. I'll fall somewhere (probably while wearing heels since I'm still a newbie) and you can save me, which will make you feel more confident about saving me. We can save money by learning Adobe Illustrator in a coffee shop instead of shopping, and maybe someone will recognize us there. I'll shut up once in a while so you can speak up too :) And who knows maybe you'll figure out what you want to do with your life here in CA and you'll strive to work harder and raise your GPA when you go back in the Fall. I love "Change someone's life". That's such a good one. Your goals sound wonderful. I especially love that you want to fly a kite, speak up more, and change someone's life. I did a post on my goals on my non-style blog, but in a nutshell: run more, do yoga more, write more, don't buy clothes. Most of my resolutions are about my blog, you should check them out! I like the "take a picture every day" one! you have some really good goals for the year and i hope you achieve them all! i don't personally have any resolutions, but your last 3 are things i definitely need to work on! good luck & have an awesome new year! love your checklist! the design is fantastic! happy new year! and that is the kind of resolution i like: spesific & straight to the point! good luck with it! good luck with all your goals for 2011, happy new year! uf! i have some many but... are secret jejeje! many of which apply to me as well. good luck with those, and happy new year! jasmine, i love your plan too! Excellent goals! I'm intrigued by the "Mom" dress, and the rest of your ideas are very noble. I made a similar list for my resolutions if you want to see it!